Tucker the dog listens to a book about cats. 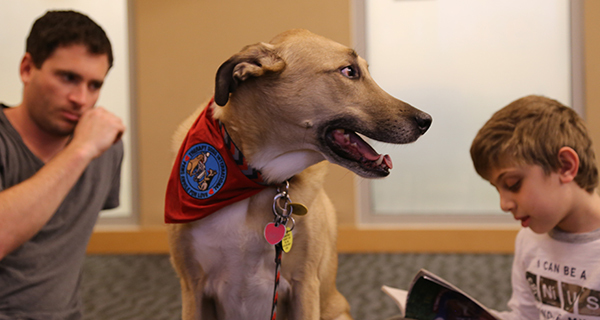 Tucker is a trained therapy dog, he has brown inquisitive eyes, and when he’s not comforting residents at rehab centers and retirement homes, he listens to kids read at the Needham Library. It sounds strange, but it’s an idea that is fairly popular in the library community. Paula Dugan, the Children’s Supervisor at the Needham Library, actually borrowed the idea from a library where she previously worked. 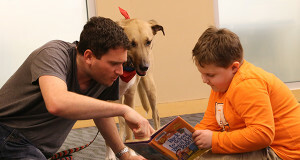 Bringing a dog like Tucker to a library is targeted largely at kids with reading disabilities, or those who are simply nervous about reading aloud. Tucker, sitting tall, watching silently, and unable to chide children for reading too fast, too slow, or to hound them for mispronouncing words, is a listener with whom kids can build their reading confidence. Tucker listens to his first reader of the evening. “But lots of kids just like doing it because of the dog,” she added with a laugh. “He gets along with most animals,” Cutter responded. “What has he liked in the past?” another boy asked. As the kids settled cross-legged on the floor, Tucker meandered over, gave their faces a sniff or two, stuck his nose in the open pages, then took a seat bolt upright across from the reader. Without fail, Tucker started each session this way. The kids settled into their reading, which included books like “The Magic Treehouse Seven,” or “Back to School, Weird Kids Rule.” At times, Tucker began to slowly meander about the room. A sniff here, a drink of water there, then back to his seated attention. Silently, Tucker seemed to agree: “I concur." Owner Adam Cutter helps sound out some words while Tucker takes a closer look. The name Tucker comes from Kentucky - that’s where Adam and Rebecca Cutter derived the name from for the five-month-old mutt they found in a New Hampshire shelter seven years ago. The Cutters always talked about wanting him to become a therapy dog, and about two years ago, they finally started training him. Silently, Tucker seemed to agree.